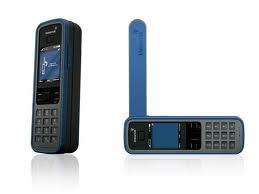 Inmarsat's IsatPhone Pro is a worldwide satellite phone offering 2.4k voice, text to sms, 160 character text to email. and 20kbps data. It has a built in GPS and position data can be sent as text. It conects to your laptop with a mini USB cable. The battery has 8 hours of talk time, 100 hours of stand by time, and it recharges in 3 1/2 hours. The phone measures 170mm (6.7") x 54mm (2.1") x 39mm (1.5") and weighs 279g (9.8oz). There is a monthly service charge ranging from $15 with no bundled minutes to $240 with 300 bundled minutes. Additional minutes cost between $0.99 and $0.80. You can buy addition airtime packages ranging from $30 for 25 minutes ($1.20/minute voice and $0.60 for outgoing text) to $3500 for 5000 minutes ($0.70 per minute for voice and $0.35 for outgoing text). Incoming text is free. See the SatPhoneStore website for more details. 37124 visits to this page since 28 Nov 2012.